PCI Express (PCIe) is the most extended high-speed serial computer expansion bus. It is the de-facto standard for expansion boards in PC computers and it is gaining acceptance in Industrial PCs and even in SCADA systems. 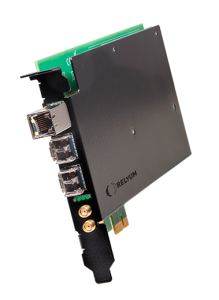 RELY-PCIe is a smart pluggable board that comprises in the same device hardware and software resources to implement specialized networking, synchronization (IEEE 1588) and security oriented services. These key features makes RELY-PCIe platform the most reliable and multipurpose networking device for critical environments.